MOLLUSCA : NUDIBRANCHIA : Dotidae SNAILS, SLUGS, ETC. Description: A tiny, inconspicuous Doto of the coronata group, with 4 to 5 pairs of cerata. The ceratal tubercles are rather elongate and have terminal maroon-red spots, except for the apical tubercle, which often lacks the spot. The body is white with sparse mottling of red pigment. 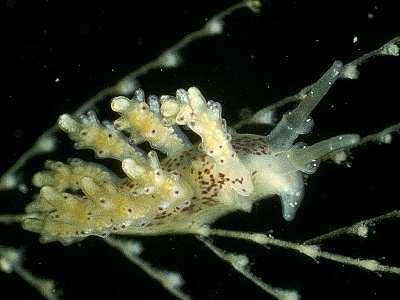 Habitat: This nudibranch feeds exclusively on the small plumulariid hydroid Halopteris catharina. This hydroid grows in dense patches on rocks, wrecks and on Ascidia mentula mostly in the circalittoral zone. Doto maculata lives, and lays its white ribbon of spawn at the base of the hydroid colony. Distribution: Sparsely recorded from the western coasts of the British Isles and the Irish Sea, but probably not as uncommon as records suggest. Similar Species: Can be distinguished from Doto coronata by the lack of red pigment on the inner faces of the cerata. Red pigment spots on ceratal tubercles and on body. Ceratal tubercles elongate, terminal tubercle frequently unspotted. Picton, B.E. & Morrow, C.C. (2016). Doto maculata (Montagu, 1804). [In] Encyclopedia of Marine Life of Britain and Ireland.